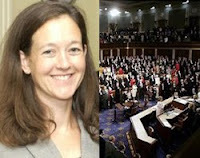 Since Bart Stupak has admitted that he'll support pro-abortion healthcare anyway, let's pray that Kristen Day and Democrats for Life are more successful in getting CINO Pelosi and the party leadership to allow a vote on excluding abortion from government-run healthcare. Democrats for Life of America claims to have 40 congressmen who will vote against the House health care reform legislation if taxpayer funded abortion language is not removed from the bill, the organization announced on Thursday. The 40 vote coalition concerns the refusal of the House leadership to include language that would prevent abortions from being paid for in any new health care reform scheme. If Hyde Amendment-type language were inserted into the bill, Democrats for Life of America (DFLA) says, taxpayer funded abortions in appropriations bills would be prevented. Several attempts to insert such language have been unsuccessful in committee. "I want to be clear, pro-life Democrats want to help pass health care reform but our coalition can in no- way support reform that includes tax payer funded abortions. If the leadership will remove that language, we feel confident that we can deliver enough votes to help put this much needed reform over the top in the House," Kristen Day, DFLA Executive Director, said in a statement.